FT. LAUDERDALE, Fla.—Republican Florida Gov. Rick Scott says he is prepared to hit the ground running if he defeats Sen. Bill Nelson (D.) in a hotly contested race next week, telling the Washington Free Beacon he is prepared to enforce tough new sanctions on Iran and forward President Donald Trump's national security agenda in Congress. Scott, at a "Bikers for Trump" campaign stop in southern Florida on Sunday, urged the 75 or so supporters in attendance to "go out and fight" in order to help Republicans win the ticket in several highly contested races that could serve as a bellwether for conservative candidates across the country. Scott, decked out in a patched-over biker's vest he borrowed from one attendee, told the crowd that border security, lower taxes, and increased job growth amounts to "more prosperity for all of us." "But we have to get out and vote," Scott said, an admission that Republicans are facing an uphill battle as liberal Democrats across the country galvanize in hopes of sending President Donald Trump a message of dissatisfaction. Scott has positioned himself as a Washington, D.C., outsider, putting him at a stark contrast from Nelson, who has served in the Senate for 18 years and earned himself a record that Scott says shows little returns for Florida and the nation. "There's no blue wave, but if we don't vote, there could be," he said to chants of "USA," a staple that can be heard radiating from crowds at Republican events across Florida. "We need to win all these races." 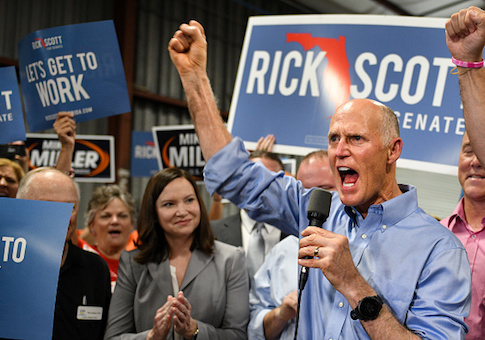 Scott, in comments before the crowd and separately to the Free Beacon in an interview, emphasized his commitment to helping average Florida citizens, but also discussed his readiness to confront the globe's toughest foreign policy issues as senator. Scott, an avid Free Beacon reader who praised this reporter's publication and said he reads it "every day," criticized Nelson on key foreign policy issues, vowing a vastly different approach from the current sitting senator, who has endorsed the landmark Iran nuclear deal and worked to remove sanctions from the Islamic Republic. "Here's Bill Nelson," an energetic Scott told the Free Beacon after shaking scores of hands. "He wants to complain about the federal government, but he's part of the federal government. He is responsible for how they act." Nelson has served in the Senate for over a decade, but he has "never done anything," Scott said, discussing his record as governor, which has been praised by liberals and conservatives alike due to his focus on topline issues. "He's done a bunch of photo [opportunities] and nothing else." Asked how he sets himself apart from Nelson, a veteran D.C. insider, Scott told the Free Beacon, "I'm for the average person who says, ‘I want to keep my money, I want to get a good job.'" When informed he was speaking to a Free Beacon reporter, Scott beamed, telling this reporter, "I look at it every day." "I think the way you guys do your website, that's what I appreciate," he said. When pressed on foreign policy issues, oftentimes a tough milieu for state-based politicians. Scott did not demure. "I represent normal people. I grew up in public housing. I don't know my Dad. My family has had a lot of problems, the same problems your family has had." "I can relate to their issues. I've shown up for eight years and said, ‘How can I solve your problems?'" "Bill Nelson, he doesn't show up. He is Washington. It doesn't appear he wants to come down here and campaign. He wants to stay in Washington. He never does anything," Scott said, noting that, in his estimation, Nelson has proposed over 900 pieces of legislation, only 11 of which "have become law." "He'll propose a bill," Scott said, "it never goes anywhere." Sen. Lindsay Graham (R., S.C.) stumped for Scott, even though the veteran Republican rarely turns out to help unseat sitting members of Congress. "When Bill Nelson supported the Iran deal, it was completely anti-Israel," Scott said, embracing a tough new package of economic sanctions that are set to hit Iran on Monday. "It was a horrible deal and he supported it." Scott, as the top official in Florida, also has worked to thwart the influence of communist regimes in South America. When it comes to "Iran, Cuba, Maduro, Ortega, we've got to fight all this stuff," Scott told this reporter. Those in attendance at the Scott rally say they understand the gravity of the election. Although it's a mid-term battle with no presidential ticket, Trump remains one of the most galvanizing forces on both sides. "I don't think, in my opinion, that the election is so close," said Joey Porcelli, 56, a Palm Beach County resident who turned out to the Scott rally. "The media and the polls are corrupting it. I can't take that chance, so that's why I'm here." "To me, Rick Scott is a businessman and not a politician and that's why he gets things done," Procelli said, echoing comments from many of those who are backing Scott in his bid to defeat Nelson. This entry was posted in National Security and tagged 2018 Election, Bill Nelson, Rick Scott. Bookmark the permalink.